One of the best things about being a runner is that your appetite tends to increase; in my case, it increases exponentially. Food is obviously an important part of a balanced training plan, to give you energy, help your body recover, and of course, serve as a fantastic incentive for finishing up those miles. 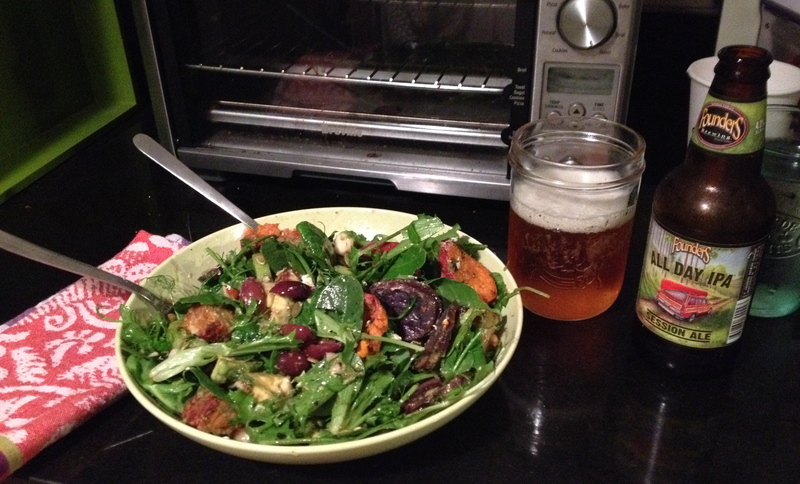 Since food is both awesome and important for runners and non-runners alike, I’ll be posting some of my favorite recipes every week. They will usually be the ones that are my go-to’s, which means they won’t be super complicated or time consuming, and will tend to revolve around several key ingredients that I try to always keep around. In all my meals, I try to use foods that are nutrient-dense, to get the most out of every calorie, and high in natural flavor, so that I don’t have to add a ton of salt or sauces. This is why you’ll be seeing a lot of sweet potatoes around here: they are delicious, versatile, and very good for you. 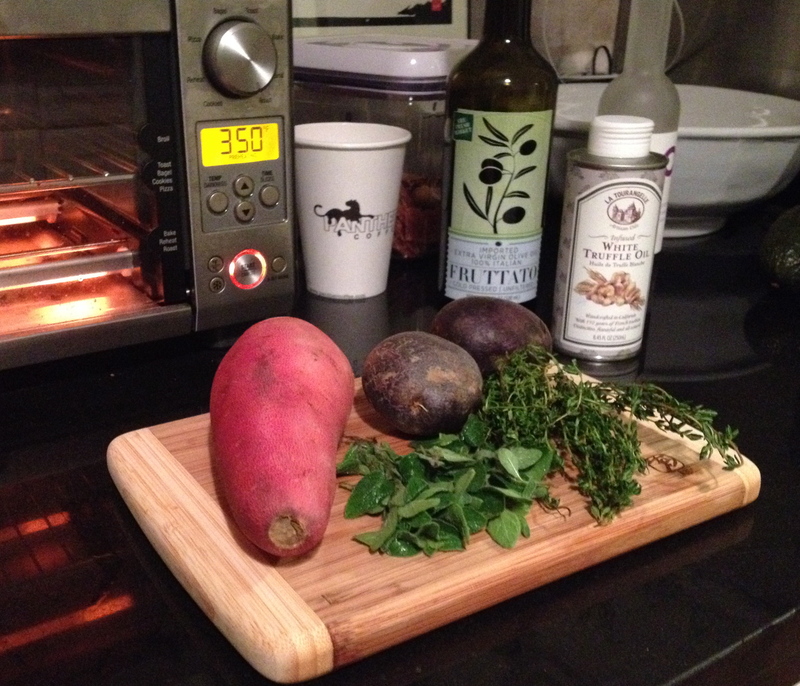 Since I am neither a scientist nor a doctor, I’m not going to really go into the specifics of the nutrition and health benefits of the sweet potato but a good starting point is this article, if you’re curious. 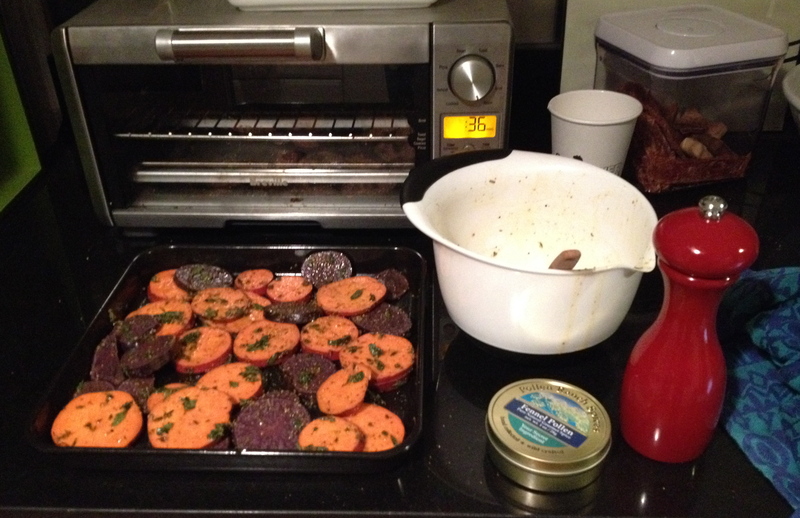 It also explains the whole sweet potato / yam thing, which had me seriously confused for a while. 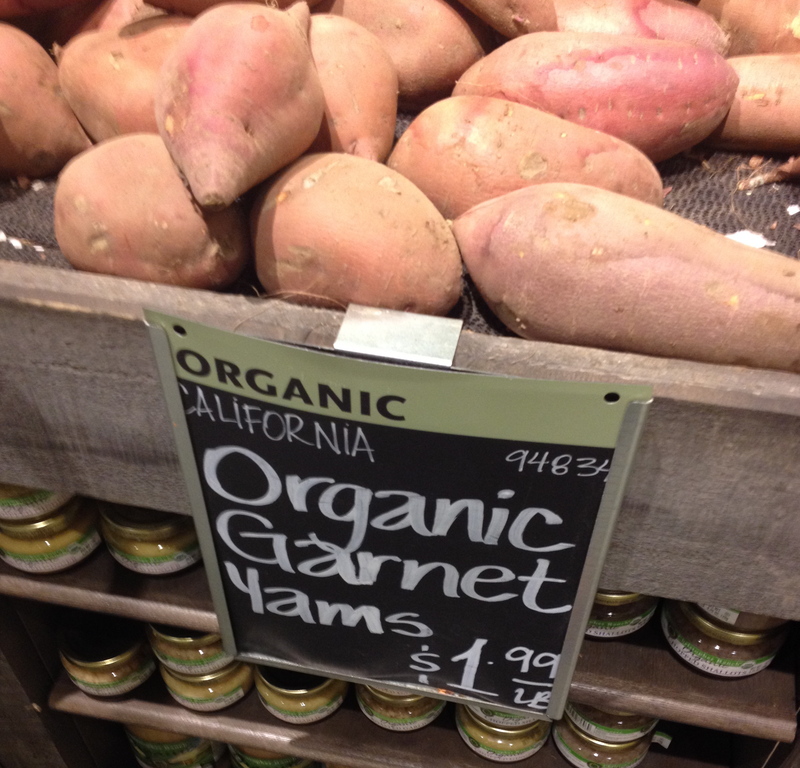 Technically I bought garnet yams today, but all that really matters is that they’re delicious. Blue potatoes are also personal favorites of mine. Aside from roasting them, I immensely enjoy consuming them in the form of Terra Blues Potato Chips, which have been a deciding factor more than once when choosing between JetBlue or Southwest for an upcoming flight. Sometimes, when my grocery store is out of those wonderful snacks, I wonder if it’s because I have personally consumed their entire inventory, or whether there are others out there who are equally obsessed. Blue potatoes are, like the sweet potato, significantly more nutrient-packed than your average old potato (check out this article if you need more substantiated evidence). This is my basic recipe for roasting potatoes, which can be used for a lot of different dishes, or just eaten cold out of the fridge. Fair warning: I’ve never been very good about exact measurements when I cook. I tend to use the eyeball method, which might be why I’m not great with baking. But since you’re basically just tossing sliced potatoes with olive oil and seasoning, it isn’t an easy recipe to mess up. I’ll give you some general numbers, but just remember that it’s really done to taste more than anything. You can also, of course, use any kind of potato your heart desires; I just personally find these types to be much more interesting and delicious. I will also use this recipe for roasting vegetables like yellow squash, zucchini, and bell peppers, which are great on their own or tossed into a pasta dish. I’ve adjusted the amounts for the number of potatoes I used tonight, but again, I don’t usually measure so formally. I like to use enough herbs, seasoning, and oil so that all the potatoes are covered, but not dripping. There shouldn’t be too much excess oil in the bottom of the bowl once you’ve mixed it all together. You can use more or less (or no) truffle oil, depending on your preferences. It is not a cheap ingredient, but a little goes a long way (one night, I accidentally used way too much, and my apartment smelled like it for days, which wasn’t as pleasant as it may sound). I have yet to find fennel pollen in any of my local grocery stores, so I get it online from Abe’s Market, which is kind of like Amazon for the health food junkie. Fennel pollen is really worth having around, I promise. It has a wonderful, warm flavor and aroma, is great in savory and sweeter dishes, and can be used before cooking or as a garnish. I haven’t had the best luck keeping any herbs alive in my north-south facing apartment, but if you’re lucky enough to be in a situation where your houseplants don’t give up on life the second you adopt them, it’s worth having a few potted herbs around like oregano and thyme. Before throwing the potatoes in the oven, I grind a bit more black pepper over them, and sprinkle another light dusting of fennel pollen. I’m going to save the mixing bowl, so I can use the leftover oil and seasoning for the tempeh I’m going to cook for my salad. I’ve preheated my little Breville toaster oven (which is the best thing ever) at the roast setting (350F), and am leaving the potatoes in for about 35 minutes. It’s best if you flip them about halfway through, but it won’t be the end of the world if you don’t, especially when they are sliced on the thin side. (I totally forgot this time around, whoopsies.) If you’re using a bigger oven, just keep an eye on them in case you need to adjust your timing. They’ll get a little bubbly-looking on the surface when they’re almost done, and you’ll be able to easily stick a fork through them. When the potatoes are done, top them with a bit of goat cheese (feta is also great, or gouda, if you’re feeling indulgent), and garnish with any remaining herbs. I’m sprinkling some more fennel pollen on these, because I’m obsessed. Now eat and enjoy! These are going into my salad tonight, which is also a great use for them as leftovers. So now I’m going to go enjoy every single wonderful calorie on my plate, and probably finish up season three of The Killing, a show that I highly recommend you watch beginning with the first season, unless you have an important deadline approaching, in which case, run away from Netflix. I can’t get over how awesome it is that Mireille Enos doesn’t seem to wear any makeup, at all, which is appropriate considering the interest the show has in gender issues. Also, Peter Sarsgaard is just being plain old fantastic. Ok. Enough. Thanks for reading, I’m going to go be a vegetable now. 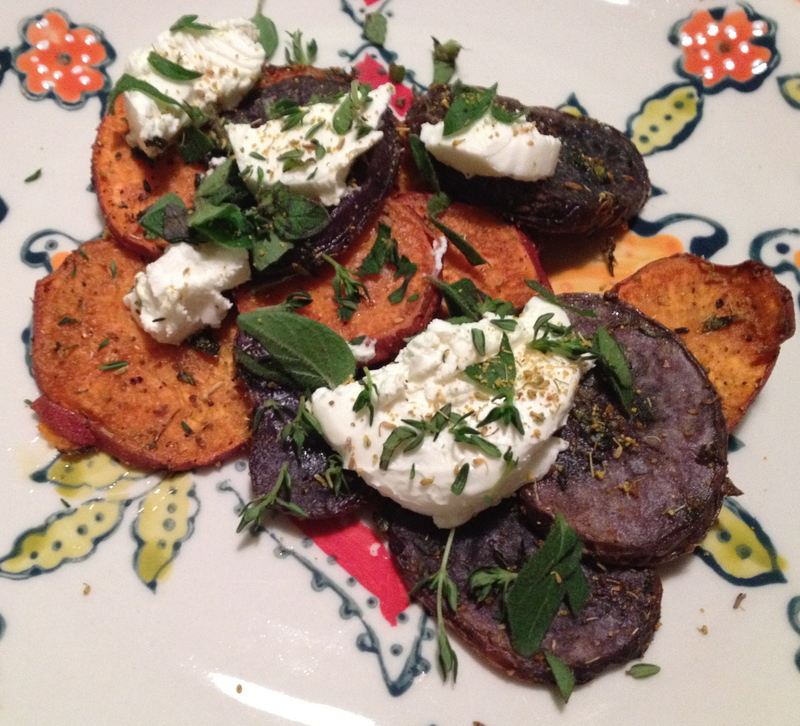 This entry was posted in Food and tagged beer, blue potatoes, fennel pollen, goat cheese, roasted potatoes, sweet potatoes, vegetarian on November 13, 2013 by libbygates.